The Movie > Timeline sub-palette gives access to the TimeLine. The TimeLine will allow you to save different points of view while sculpting, to save the position on the area you are currently working on and then switching very easily to a global point of view to have an overall look before going back to your area of sculpting. The Timeline feature lets you animate several elements, from the camera position to 3D layers, ZSpheres and more. The Load button will load any saved Timeline. The Save button will save the Timline and all the tracks. The Show button will display the Timeline. Copy Multiple Keyframes = Shift+Click on all the Keyframes to be copied. Then Shift+Click on the Timeline. Transition Keyframe = CTRL+Click on an existing Keyframe. Rigid Keyframe = ALT+Click on an existing Keyframe. Override an existing Keyframe = SHIFT+CTRL on the existing Keyframe to change the parameters of the Keyframe. The ExportName button will export all Timeline Tracks into a MDD file to be imported into another application. The Go Previous button selects the previous keyframe from the current selected dot on the Timeline. 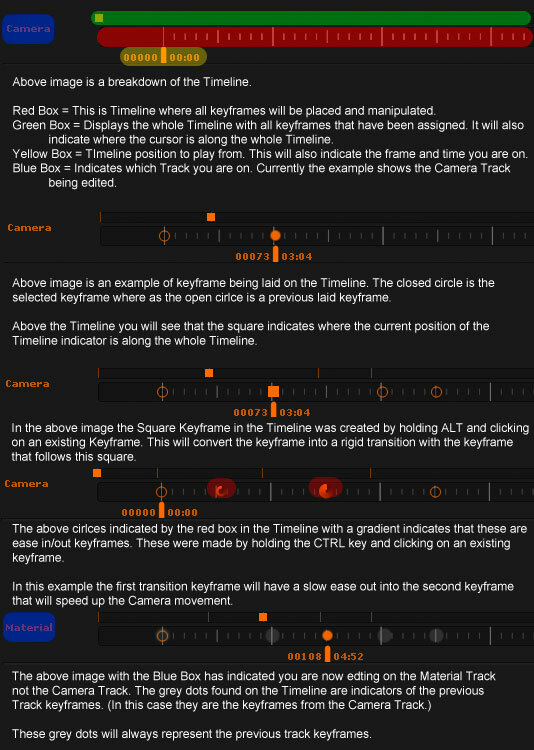 Using the Left Arrow key will keep selecting the keyframes to the left of the selected keyframe on the Timeline. The Go Next button selects the next keyframe from the current selected dot on the Timeline. Using the Right Arrow key will keep selecting the keyframes to the right of the selected keyframe on the Timeline. 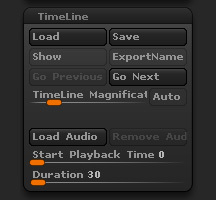 The Timeline Magnification slider will magnify the Timeline when the selected keyframe is clicked. The slider sets the magnification amount. By default this is set to 4 which will magnify the Timeline by 4 times when the selected Keyframe is clicked. The Auto button will automatically set the optimum value for the magnification of the timeline and won’t use the Timeline magnification slider value . The Load Audio button will load an audio file into the Timeline. The Timeline Duration will be adjusted to fit the length of the audio file. The Color beats in the Timeline Tracks is an excellent way to marker high points of a audio file or for tracking to match up lip syncing. The Remove Audio button will remove any audio along the Timeline. The Duration slider will set the length of the Timeline in seconds. By default this is set to 30 seconds. Remember that if an audio file has been loaded to the Timeline the duration will be adjusted to the length of the audio file.